An Armor-level Ghost Digimon that evolved through the power of the "Digimental of Purity". 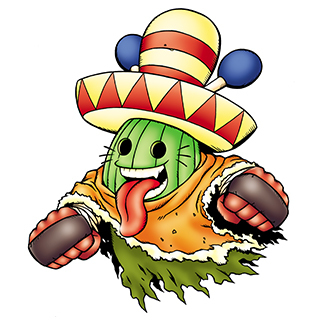 Although it is classified as a Ghost-type, it is an unusual Digimon that appears to be a Plant-type, judging from its appearance, and it is rumored that when a Togemon has died due to unforeseen circumstances, it will become a Ponchomon. 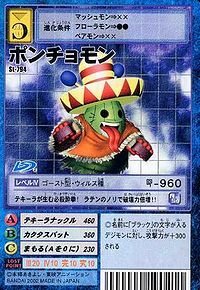 It is said to be a Digimon that was generated from a "Latin music distribution program" that exists on the Network. It looks as though it has a cheerful personality, but its facial expression can't be read, and it is eerie to other Digimon. Because all of its actions are performed with a Latin rhythm, it views Digimon that can't keep up with the beat as its enemies. It seems to get along with Bakemon, who moves to its own music. Its Signature Moves are striking the opponent while getting into a rhythm with the maracas attached to its Mexican hat (Blood Dance: Maracas Version), and driving punches that only hit the opponent's face with its leather-strapped fists, intoxicating them with its destructive power (Tequila Knuckle). A Mutant Digimon that evolved due to the Digimental of Purity. Special Move - Drives punches that only hit the opponent's face with its leather-strapped fists, intoxicating them with their destructive power (Tequila Knuckle). n., A poncho is a cloak-like a blanket that is often worn as a raincoat. Tequila Knuckle  テキーラナックル Tekīra Nakkuru Drives punches that only hit the opponent's face with its leather-strapped fists, intoxicating the opponent with that destructive power. Blood Dance: Maracas Version  ブラッドダンス・マラカスバージョン Buraddo Dansu Marakasu Bājon Strikes the opponent while getting into a rhythm with the maracas attached to its Mexican hat. Ponchomon is one of Baromon's henchmen, along with Sepikmon and Pipismon. 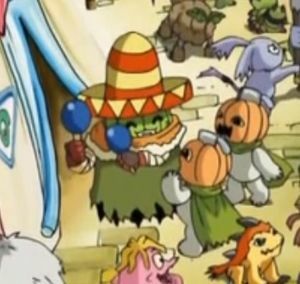 Ponchomon can be seen talking to two Pumpmon in Episode 11. In Episode 17, Ponchomon is watching the eating contest at the Autumn Leaf Fair, and in Episode 18, several Ponchomon watch the Great Trailmon Race. A few Ponchomon contribute to the mass fusion creating Shoutmon X7 Superior Mode, and at least one Ponchomon appears as the Digimon return to the Digital World after the defeat of Darkness Bagramon. Three Ponchomon are shown in Digimon Land: one greets the human children who visit, one sells chocolate-covered bananas, and one sells popcorn. Ponchomon is shown in a crowd of Digimon and humans watching a battle at the battle arena. Four Ponchomon appear as NPCs. Two work as clerks at each El Dorado Club (one in Asuka City and one in Amaterasu City), where they offer the player information on items. The other two Ponchomon make the Twinkle weapon if the player has the Old Wand and Khakkara weapons. The third Ponchomon can be found in the Protocol Ruins of Amaterasu East if the player has Patamon at level 45 or higher. The last Ponchomon is at the Mirage Tower of Amaterasu West if the player has Renamon at level 45 or higher. Ponchomon appears as an NPC in the Desert Cliffs area, where it rolls rocks at the racers to try to make them crash. 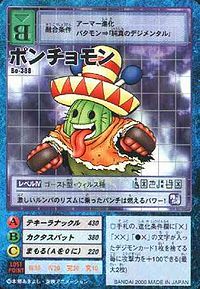 Ponchomon may evolve from Wizarmon if it is above level 27 and holding the Digimental of Sincerity. An NPC Ponchomon is a merchant at the DigiFarm shop. 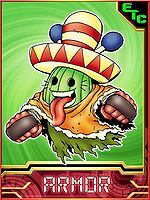 Ponchomon is only obtainable as a collectible card. Its card is part of the Digimental of Purity (純真のデジメンタル, Junshin no Dejimentaru) set. Ponchomon is available as a Digimon Medal. Its special drunken boxing technique is born from tequila! Its destructive power doubles with the Latin beat!! Its punches burn up with power as it moves along with the intense rhythm of rumba!